The perfect warming, nourishing dish that is packed with wonderful flavours & vitamins & minerals. Soak the lentils in cold water for 20 minutes. Finely chop the shallots, garlic, & ginger, add to a pan with 1 tablespoon of coconut oil. Gently heat in the pan for 8-10 minutes, until the mixture has completely softened. Make a split in the large green chilli & add to the pan along with the spices & vegetable stock. Once the lentils have cooked, rinse & add to the pan too. Diagonally chop the veg into ½ inch chunks of courgettes, sweet potato & cauliflower. Place on a griddle pan & cook both sides until you have griddles lines clearly showing. Add to the pan with the coconut milk & 1 heaped teaspoon of coconut sugar, chopped coriander stalks & leaves, peas & the freshly squeezed lime juice. Allow all the flavours to simmer together, until cooked thoroughly. Please carefully stir the mixture so the chopped griddled vegetables keep their shape. Serve with brown or white rice with fresh coriander as a garnish. 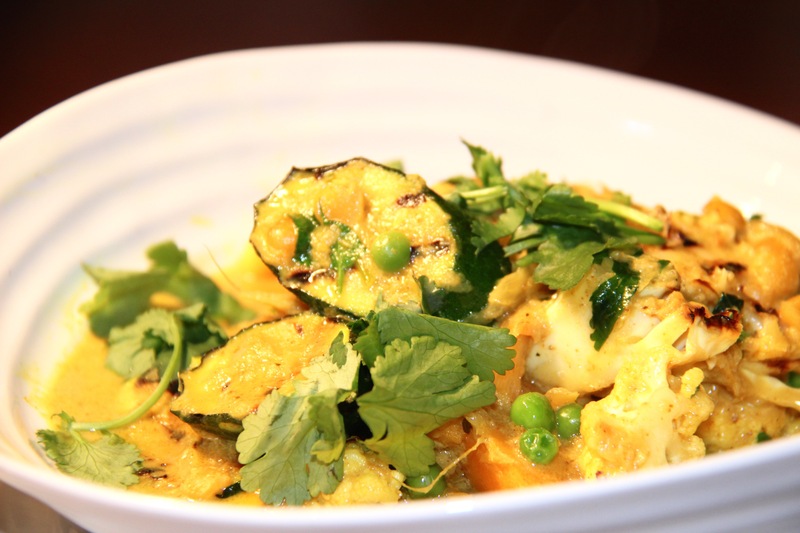 This curry benefits from being packed full of plant fibre & natural vitamins & minerals. The aroma smells amazing while cooking & the lentils are great source of natural protein. Lentils are an excellent natural folate, one cup of lentils provides almost half your daily recommended intake of manganese. Iron, phosphorus, thiamine & potassium. I used shallots as the base for this curry because they are sweeter than onions & they have a better nutrition profile with more antioxidants, minerals, & vitamins. In particular iron, calcium, copper, potassium & phosphorus. This curry also tastes sensational the next day too. I hope you enjoy my curry recipe & I look forward to hearing you. » Main Courses » Tasty coconut & ginger, vegetable curry.